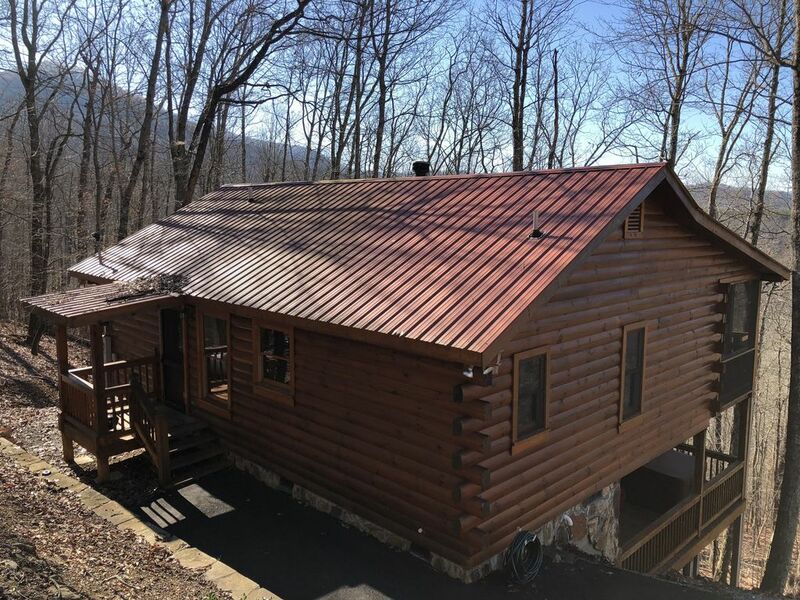 Cozy Log Cabin Off Aska routiers minutes du centre ville de Blue Ridge! Super Belle Log Cabin avec vue magnifique sur la route pavée à seulement 3 miles du centre-ville de Blue Ridge, hors Aska Road. Situé à 90 minutes de conduite facile d'Atlanta. Cette cabine est complètement fait pour vous faire sentir comme vous êtes en vacances dans la maison de quelqu'un! Porche de l'écran immense et spacieuse pont inférieur avec bain à remous récent. Cheminée pour le curling avec un verre ou un bon livre. Les deux chambres ont une vue magnifique! La cuisine complètement équipée avec tous les trucs à droite. Il ya une route pavée de la maison. Ce est une grande cabine escapade. Check it out, vous aurez envie de revenir souvent! The cabin was great. We would diffidently stay here again. Loved sitting on the screened porch looking over the mountains. The beds are comfortable and kitchen well stocked. This sweet cabin was great for our family of three. The cabin was spotless clean. In the evenings we enjoyed the hot tub on the deck below. The only difficult thing was that our 60 lb. golden doodle didn’t really have any place to go to the bathroom because of the steep surrounding incline. amenities such as enough towels and cooking equipment. It has beautiful views! I would have rated this a 5 but for the driveway which was a challenge for me. If you are ok with backing up hill and then down again to get to the road then this will be a lovely place to be. Amazing Place to Spend Christmas . . . or Anytime! We fell in love with this cozy cabin the minute we walked in the door. Seeking a peaceful get-away for Christmas, we were pleased to find holiday decor thoughtfully placed around the beautifully furnished cabin. Our Boston Terrier loved the screened porch and we loved the fireplace for which there was an ample wood supply. The kitchen was well supplied. The view was amazing and we hope to return during other times of the year. Amazing views with this very charming, cozy and perfectly secluded cabin!! We loved our stay here. The kitchen is stocked very well. We were able to cook just like we were at home. The furniture is so comfy. The bed rooms were stocked with extra blankets which we did not need because the fire place is amazing!! Plenty of wood for the fireplace too. The hot tub was clean and secluded even covered so it could be used in the rain. This was the perfect place for us to relax before the craziness of the Christmas holiday. Such a beautiful, warm and cozy space. The cabin was so nice. Very clean and comfortable. Loved the way it was furnished and decorated. A little challenging navigating the steep road and driveway, but my Camry handled it. We would like to return during warmer weather so we could enjoy the very nice screened in porch.